A Love Supreme – 50 Years On… While I’m eagerly awaiting Jazz On 3 broadcast of the entire performance of the Enlightenment Ensemble’s “Re-envisioning of John Coltrane’s ‘A Love Supreme’ at last summer’s Meltdown, the crew at Folded Wing announce their forthcoming contribution to the celebrations. On Tuesday 10th February at 11.30am on BBC Radio 4, outer-nationally renowned saxophonist Courtney Pine celebrates 50 years of John Coltrane’s ‘A Love Supreme’ and explores what makes ‘A Love Supreme’ such a unique and seminal record. John Coltrane intended ‘A Love Supreme’ to be a devotional statement album: a declaration of his religious beliefs and personal spiritual quest. However the album also had a wider cultural significance. Released in February 1965 – just days after black rights activist Malcolm X was assassinated, and weeks before Martin Luther King led the ‘March on Alabama’ – for many, the sound and feel of ‘A Love Supreme’ perfectly captured the sadness, confusion and anger of America’s growing black consciousness movement. 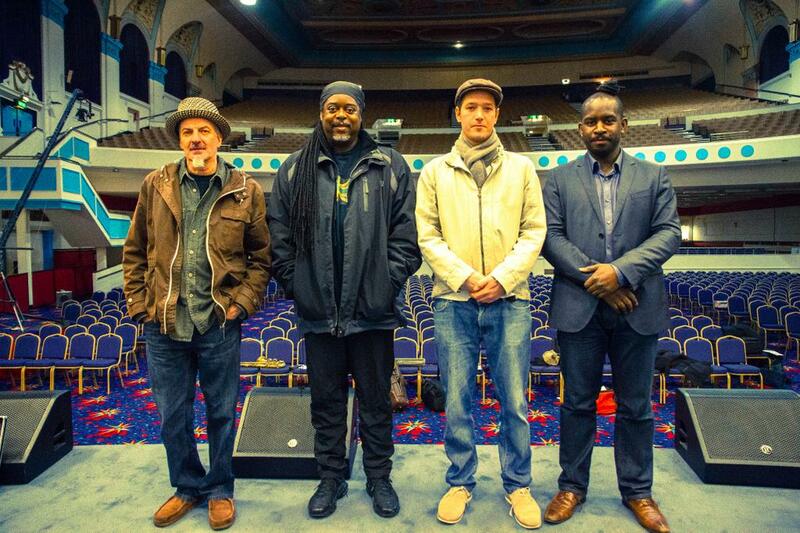 Courtney, along with fellow saxophonists Nat Birchall, Finn Peters and Jason Yarde visit the Gaumont State Theatre in Kilburn, North London, where John Coltrane performed in 1961 alongside fellow saxophonist Eric Dolphy. It was a performance that divided the audience and earned him a critical slating in the music press. Trane never returned to the UK. 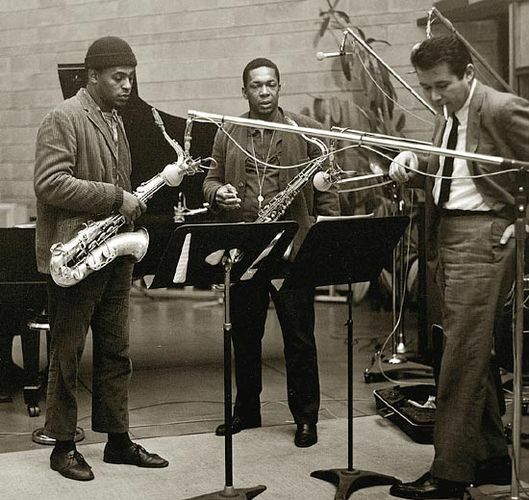 Archie Shepp, Trane & Bob Thiele at the recording of ‘A Love Supreme’. The programme also features Archie Shepp, Evan Parker, Chuck Nessa (of Nessa Records) and writer Ashley Kahn who also explore why this 33 minute long suite of music transcends generations and continues to resonate with and inspire music lovers across the world. ‘A Love Supreme – 50 Years On’ will air on BBC Radio 4 on Tuesday, 10th February at 11.30am, and will be repeated on Sunday, 15th February at 1.30pm. It will also appear on BBC World Service (TX date – TBC) . This entry was posted in Is That Jazz?, Just Runnings and tagged 50th Anniversary, A Love Supreme, Archie Shepp, Ashley Khan, BBC 4 radio, Courtney Pine, Evan Parker, Finn Peters, Folded Wing, Impulse, Jason Yarde, John Coltrane, Malcolm X, Martin Luther King, Nat Birchall. Bookmark the permalink. Thanks Paul, I saw the show and am a big fan of Nat so will listen to this.